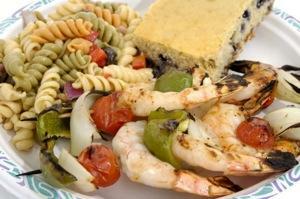 Preparing a grilled shrimp marinade is a quick and easy way to ensure that your shrimp are moist and flavorful. While there are many different recipes for marinades, it is simple to choose based on what kind of cuisine you want to serve alongside the shrimp. A marinade can be as basic as some olive oil, lemon juice and garlic, or as complex as an Indian-inspired spice mix. Try one of these delicious marinades the next time you are grilling shrimp. Place raw shrimp in a zipper-lock plastic bag or in a large bowl. Add all marinade ingredients and stir until well mixed. Seal the bag or cover the bowl and place in the refrigerator for 2 hours. 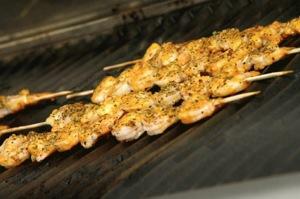 Thread the shrimp on metal barbecue skewers or wood skewers that have been soaked in water. Grill for three minutes on each side or until opaque. Brush with reserved marinade every two minutes. In a large bowl or large zipper-lock plastic bag, combine all of the marinade ingredients and mix until combined. Add shrimp and marinate for about 30 minutes and up to 2 hours. Prepare you grill to medium high heat. Thread the shrimp on the skewers and grill for 2 to 3 minutes per side or until opaque. Discard the leftover marinade. Place the first three ingredients in a small saucepan and heat until the butter is melted and the jam is fluid. Stir in lime peel. Place shrimp in the pan and swirl to coat. Thread the shrimp onto metal skewers or wooden skewers that have been soaked in water. Sprinkle the shrimp with salt and then place on the grill. Grill for 2-3 minutes on each side or until opaque. While grilling, constantly brush shrimp with the glaze. This recipe combines the tang of red wine vinegar with the tartness of tomatoes. A perfect summer dish, prepare this recipe when tomatoes and basil are in season. The freshness will show in your final product, and your guests will love it. In a large bowl, mix together garlic, olive oil, tomato and vinegar. In a small bowl, make a paste of the basil, salt, cayenne, and pepper. Add paste to the liquid mixture, making sure to mix well. Add shrimp to the marinade, allowing to sit for at least one hour (preferably four or five!). Heat your grill to a medium heat. Slide shrimp onto skewers, making sure to keep their round shape by poking first near the tail, and then near the head to make a "C" shape. Cook shrimp on grill until the shrimp just begin to look opaque, about three minutes depending on how hot your grill is. Enjoy hot or slightly cooled. This spicy recipe will leave your heat-lovers licking their fingers. A bit of tang and heat go well together, especially when combined with shrimp's delicate texture. Magnifique! In a large bowl, mix olive oil, vinegar and hot sauce. One at a time, whisk in lemon juice, and then celery seed, and then sea salt. Allow to sit for 15 minutes at room temperature. Add in onion and let sit for another five minutes. Add shrimp to the marinade, allowing to sit for half an hour to an hour. Cook shrimp on grill until they just turn opaque, about three minutes depending on how hot your grill is. These shrimp taste best when they've been left to sit for five minutes before serving. Here are a few important steps to take when grilling marinated shrimp. First, find the very best large or extra large shrimp, fresh if possible, with the shells on. Keeping the shells on is important because it imparts flavor into the meat and prevents the shrimp from drying out on the grill. Large or extra large sizes are the best for grilling because they won't fall through the grates of your grill. Bigger sizes will also have better flavor and texture. Frozen shrimp are okay, but make certain they are well thawed before you use them and drain off any extra liquid before marinating. If your shrimp are not already deveined, clean and devein them. To devein the shrimp leave the shell in tact and make a small slice down the center of the shrimp's back. Remove the black vein with the tip of your knife and then rinse the shrimp before placing it in a dry, clean bowl. Repeat with all of the shrimp you are grilling. After deveining the shrimp, drain the excess water out of the bowl and pat the shrimp dry with a kitchen towel or paper towel. Cover and refrigerate until your marinade is finished. Let your shrimp sit in the marinade for at least an hour to let the flavors come together. Then, preheat your grill to medium high. Skewer the shrimp on metal skewers or bamboo skewers that have been soaked in water. Grill the shrimp about 2 or 3 minutes on each side, or until the shrimp are opaque and pink all the way through. If you do not have a grill, or it is to cold to grill outside, consider cooking the shrimp in a sauté pan instead. The shrimp will not have the same char-grilled flavor, but they will still be delicious. After cooking, you can heat the grilled shrimp marinade until it comes to a simmer and cook for about 10 minutes or until the marinade has reduced a little. This sauce will be delicious poured over the finished shrimp.